You're hinting back for a particular marriage certificate that should be there, but it's not. After a few fruitless hours, things can become very frustrating. But there are a number of reasons a marriage certificate might not be found - besides, of course, searcher error. Common-law marriage and wrong indexing are among them. But there are other factors that need to be discussed that can also make for problems in your search. If one of your ancestors has changed his name by deed poll, you need to be aware of whether it happened before or after marriage, for obvious reasons. But in a marriage following a name change (if it's declared to the registrar), only the new name will appear on the entry, with the additional phrase "name changed by deed poll," "formerly known as," or "otherwise." This isn't a common problem, and it's often resolved by checking the location of the marriage. But if there's still confusion, you can usually solve it by checking the names of the father or either the bride or groom against the birth certificate. In the event you find more than one possible marriage in the index as you search, it costs £2.50 to have it verified. Where a marriage is known to have been bigamous it's actually not marked as such in the register, and certificates can be issued, just as if the marriage was perfectly legal. But remarriage after a spouse had been absent for seven years wasn't classed as bigamy. Where couples remarry - that is, marry again after divorcing each other - the date and place of the first marriage should be in the second entry. If the marriage took place in church, you can look at their records to establish the date and details (they can even supply you with a copy of the marriage certificate). Local newspapers can offer another avenue, as many marriages were listed there, usually giving not only the names of the parties, but also their parents. The National Archives will be your main source here. The marriage certificates of army personnel from 1761 onwards are actually held separately from those of civilians, and you can find the marriage registers of some regiments, too. From 1920, marriage registers of all RAF personnel are in the National Archives. For sailors, the Marine Register Book lists all marriages on board naval and merchant vessels from July 1st, 1837 onwards. Records of divorce can be as revealing as the marriage certificate itself, and there are far fewer of them. 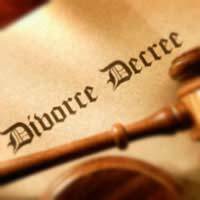 For many years, obtaining a divorce was a difficult and lengthy procedure. From 1700 to 1857, the only way a couple could divorce was by an Act of Parliament or through the ecclesiastical courts. Since that was impossible for the average person to obtain, some didn't bother with divorce, preferring instead to exchange or sell their wives! There were also deeds of separation, and legal separation could be obtained on the grounds of cruelty or adultery. From 1858 divorce became a state matter, and went from an average of three a year to a figure in the low hundreds, rising to a few thousand between the wars to over 50,000 a year. Copies of decrees absolute can be obtained by any member of the public, and the records are kept in the court where the divorce proceedings were heard. That decree is a good document for any genealogist, as it lists not only the names of the parties, but also the date and place of the marriage being terminated and (until fairly recently) the name of any co-respondent cited in the case. Although other records (such as birth certificates of children) might have been entered into the case, they're not included with the decree, and are confidential to the parties and their solicitors. In most cases, records over 50 years old are destroyed, although they can be kept longer if they relate to matters of general public concern. An index of all decrees absolute since 1857 is kept by the National Divorce Records. You'll need the full forenames of both parties before approaching them, and for a fee they'll conduct a 10-year search. They'll be able to tell you where the divorce took place, and from there you can contact the court directly for a copy of the decree absolute. I have been trying to find about my 4x gr, grandfather James Wade, born Ireland 1769, married ?,son John b. Ireland 1801. James married a Dickson at some point (possibly a second marriage??) and they had a son b. 1818 in Newton Stewart, Scotland. For whatever reason, I cannot find anything to find out where in Ireland they were from, no birth or marriage records. The Wade's in Scotland were Presbyterian. I don't think there is a headstone for James in Scotland, which may or may not have his place of origin in Ireland. These were working class people, James was a road worker at one time, a farm servant at another. So frustrating, any suggestions? My mother was born in Napier New Zealandabout 1924. What I am trying to find out is information on my grandfather who was a sailor and later travelled to America. He may have married an American Lady, ( As my mother never saw him again after she was five years old.) My grandmother did marry again. The reason I would like to know is because I may have American relatives. I do now have my mother's Birth certificate from Napier NewZealand. Thank you in Anticipation. can you tell me what happens if the date of the original marriage is shown incorrectly on the decree absolute in a divorce case and one of the parties remarries?